salt and pepper to taste (1/4 teaspoon). 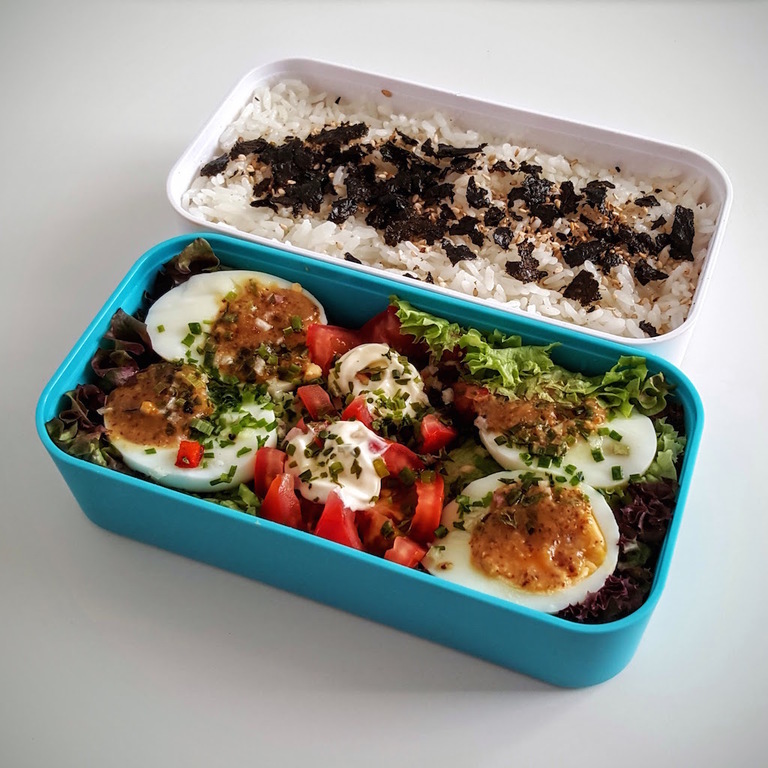 You will need rice and egg cookers, bento box and a plastic bag if you'd like to make your own furikake. Wash and cook rice, like you would usually do using rice cooker or in a pot — remember to closely follow instructions. When cooked, fill the bento container with piping hot rice and set aside to cool down under a clean cloth. Cook eggs in an egg cooker or a pot, then immediately place in cold water when done, let them cool down and peel. Both steps can be done in parallel with other steps, or evening before (in such case don't peel eggs until the morning). Wash and dry lettuce leaves and fill bottom of the bento container. Wash the tomato and using zig-zag cut from outside to the center of the fruit, make two nicely looking halves. Cut off bottoms to make each one fit the container, then place them on top of the lettuce leaves. You can garnish your tomato with some mayo! If you'd like to make your rice less boring, make your own furikake — crumble and smash nori seaweed sheet in the plastic bag, then add sesame seeds and seasoning: salt, pepper and red pepper powder. You can add other spices too, like garlic powder, dried fish flakes. Be brave! When rice and eggs are cooled down, you can assemble your box. 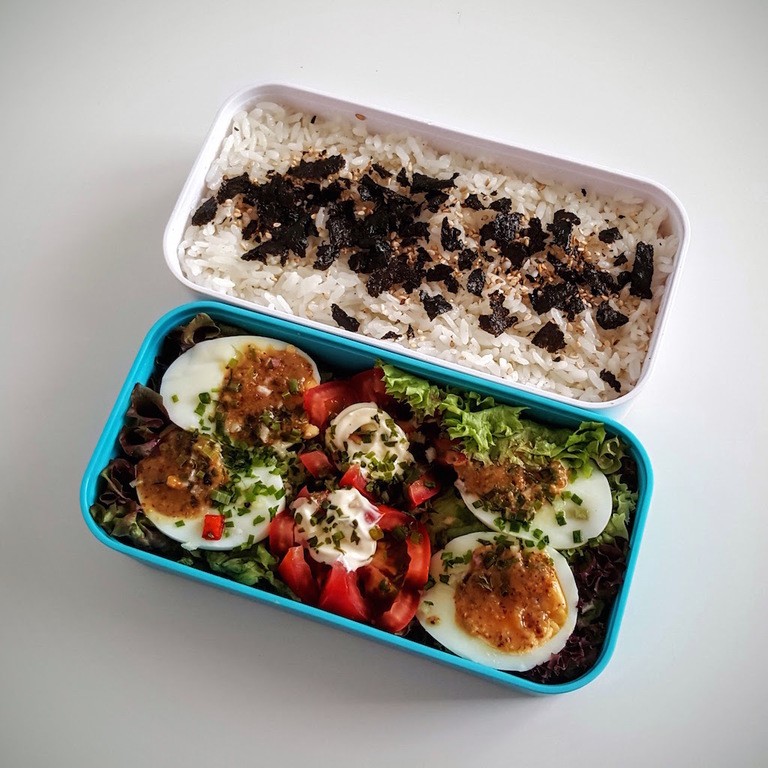 Sprinkle rice with your self-made furikake and close the rice container (you can also pack furikake into a smaller bag and sprinke before eating to keep it crunchy). Slice each egg in half, put on top of the lettuce and smear yolks with sweet mustard (or mayo and any other sauce that you like with your eggs). Your bento is ready, enjoy!